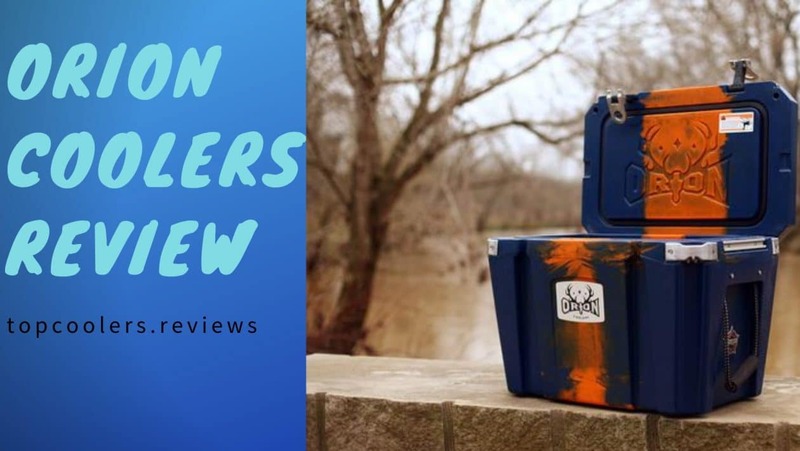 Orion Coolers Review - Is Striking The Deal Fair Enough? Orion, the Tennessee-based company, is another premium brand in the cooler industry. With their array of the product line up, the Orion deals in Coolers, Drinkware, gears, and Accessories. Formed with the motto of “Build it like it’s your own”, the products are made in the USA that is just enough to give you a glimpse of how strong and durable the products are. So, if you are venturing out on an adventure or just taking a break from your daily routine, the Orion Coolers are something that will stick by your side. Orion manufactures and deals exclusively in the Hard Sided Coolers. You can find Orion 25, Orion 35, Orion 45, Orion 55, Orion 65 and Orion 85 to choose from the category of Hard Sided Coolers. These coolers have different storage capacities. Besides the storage capacity, one thing that lures the customers is the availability of coolers in beautiful and vibrant colors. Orion exclusively deals in Hard Sided Coolers. They have a wide variety of the hard coolers that consumers can choose from. Besides this, these coolers come in vibrant and beautiful colors that seem much more appealing. Coming to their built quality, these coolers take pride in their rotomolded constructions that ensure the durability of the product. Under this category, Orion has focused to meet the consumer’s demand. Demand on an individual vary and to meet them, they have manufactured the products that come in different storage sizes. Under the Hard-Sided Coolers, Orion offers Orion 25, Orion 35, Orion 45, Orion 55, Orion 65, Orion 85. These coolers differ considerably in terms of dimensions, storage, and price. For more Series And Colors visit Here. Before buying any product we always look for its features and specifications. How does that product stand unbeaten and unmatches? Orion Coolers come up up with the plenty of features. Let’s understand what makes the Orion Coolers so interesting. Strong Built Quality – The built quality and design must live up to our expectations. Orion understands what the customers need. So, in terms of Quality and build, the Orion Ice Chest remain unbeaten. Made with rotomolded constructions and thick wall, the Orion coolers will not suffer any wear and tear. Further, the addition of thick walls can be an added advantage in retaining ice for more duration. Gasket Rubber – Besides the Build and Quality, the Orion has offered gasket rubber. This gasket rubber helps lock the cold air inside the cooler and let’s not escape it into the normal surrounding. Moreover, the warm air is prevented to enter the Orion Cooler with the help of Gasket rubber. Thus, Gasket rubber is another solid reason why ice stays as ice in the Orion Coolers. Built-in bottle openers – Built-in bottle openers will have you consume your beer when you are incapable to find an opener. You can find the bottle openers in all the sides of the Orion Coolers so that becomes so convenient for you to open your beverages regardless of your position. Made from steel that looks so premium is another attribute you can find in the Orion Coolers. YaKTrak Attack – The YakTrak Attack is another notable feature that’s worth mentioning here. The YakTrak Attack is designed in a way that can hold a variety of accessories so that you can carry them along with you when you step out of your home. Motorcycle Grip Handles – For a great grip and handles, the Orion Coolers comes with the motorcycle grip handles that give you a great grip and holding the coolers becomes so convenient and easy. This gives a premium look to the Orion coolers which is a further attribute given by the Orion. Customization – Besides all these kinds of stuff, the Orion coolers take a lead from the other brands in terms of customization. Besides the beautiful and vibrant colors available, you can customize your Orion Cooler and give it a crazy look. Get your own exclusive design on your coolest Orion Cooler. Build Quality – People are more skeptical about the build quality. The build quality of Orion Cooler is unquestionable. The strong, durable and tough cooler can face any damage and still stay strong. The Orion Coolers brag about the fact that they are made in the USA. Apart from the fact that they are made in the USA, the rotomolded construction in the Orion Coolers sums up the superior quality and toughness. Colors – The notable thing to mention here is that Orion Coolers are available in vibrant colors. From simple and sobber to bright and camo, you can find the plethora of options to choose from. The Orion coolers come in Blaze, Dorado, Forest, Stone, Red-Black, Red-Black-White, White-Blue, and Red-White-Blue. So, you can grab your favorite cooler with a favorite color. Cost – The Orion Coolers are a bit expensive. To buy the Orion Coolers, you might have to break your bank. While serving these unique features, the prices are a bit expensive which, I guess, is justified looking at the features. There are many other brands who have come up with little fewer features. So, if you want to show off and can pay the price, only then we recommend you to buy the Orion Coolers. Orion 25 – The Ice retention period usually ranges from 42 to 62 hours which is between two to three days when converted from hours. Orion 35 – Orion 35 can hold the ice between 52 to 77 hours depending on the factors. The ice retention can also vary when you put your ice in some different climatic conditions. Orion 45 – Ice retention of Orion 45 Cooler was quite impressive. The ice life ranges from 60 hours to 82 hours. For a three day trip, the Orion 45 cooler is quite amazing. Orion 65 and Orion 85 – With the maximum ice retention of more than a week, the Orion 65 and Orion 85 act as a savior and shield your beverage from the hot surroundings, harmful elements. Summing up what we have already talked about, the Orion Coolers are great when it comes to bringing unique and distinctive features. But the prices of such features are sky-rocketing. If you are looking for a simple cooler that has high ice retention period, there are a lot of brands coming to serve you. The prices asked by Orion is justified. We only recommend you to buy the Orion coolers if you are really able to spend your money and manage the rest of your month till your bank account gets credited again. You can also read our reviews about more brands to get more insight about the products. Don’t hesitate to connect with us if you have any further questions or issues. Stay connected with us and we would be more than glad to resolve your issues.